Went to SFSBC for lunch today with a couple of coworkers. This was the second visit and even better than the first. By the size of the lunch crowd, I wasn't the only one enjoying a great lunch. SFSBC is in the 4390 Town Center Blvd at the end of a row of small shops near Target. Google and Yelp have (or had) the location completely wrong (said it was on the main Town Center Blvd strip running up to the theaters) but it is just a few yards off of the White Rock Rd entrance into the shopping complex to the side of Target. The bread is made in SF and shipped up to EDH in a par-bake state then baked in the shops ovens. It is really good especially as a soup bread bowl but sandwiches are great too. On this foggy cool day, I had a clam chowder soup and turkey\pastrami sandwich combo and were much better than a Subway, Quiznos type place plus the service was not only friendly, they made you feel welcome and cranked out orders considering how packed the place was after 12. Get there before or after the lunch rush. VERY nice! love going to that place when we go to SF, its nice to have one more local now. what was the price for the combo? I've been meaning to get to this place for weeks (months? ), but haven't made it yet. I tried checking their menu/nutritional facts to find out what kind of soups they offer, but it didn't work. Besides clam chowder, what else do they offer, or is it a soup du jour kind of thing? Had a craving for something out today and a soup\sandwich combo was my first thought so I went to SFSDB Co. Had the pastrami\turkey sandwich and clam chowder. Other soup choice was a broccoli cheese and I believe it is normally a choice of two soups. 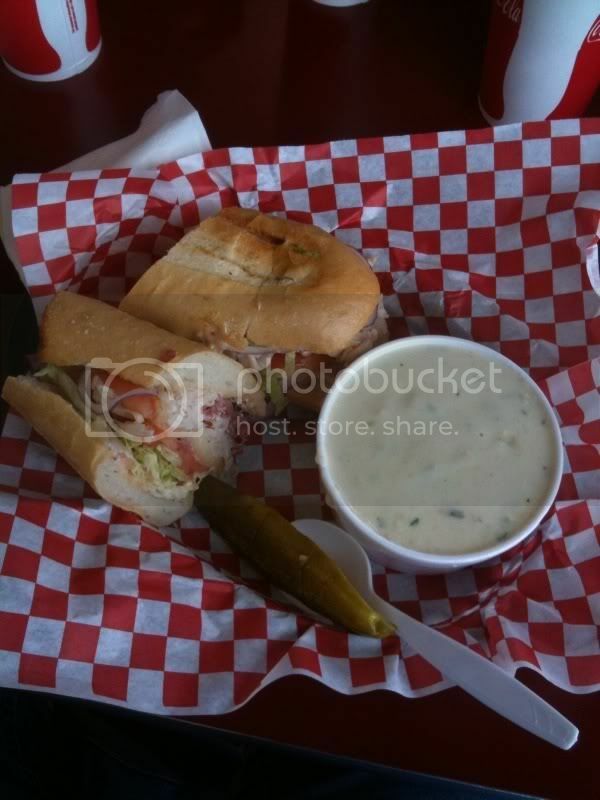 Clam chowder and a #15 Turkey/Pastrami sandwich...Mmmm good.